Full colour guide to easy programming - original 16K / 48K version. 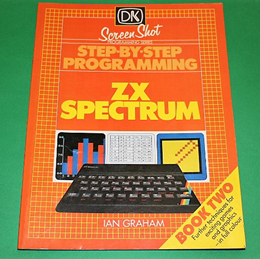 150 screen shots of program listings and prgrams in action, packed full of tips & techniques, reference charts and tables and advice on how to get the most from your ZX Spectrum. Following on from Book 1, it covers question & answer conversations, multiple-choice displays, "natural" graphics, sorting and fact-finding, curves & circles, pies & slices, bars & graphs, a guide to writing games, multiple characters and further animation techniques. An excellent 64 page paperback book in equally excellent condition.